1. 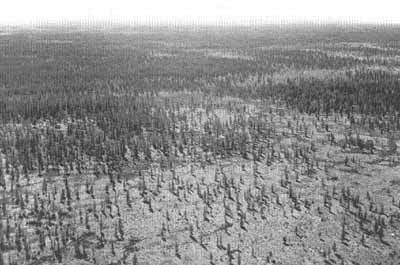 Forest-tundra ecotone, which occurs north of the Arctic tree line. It is represented by prostrate woodlands and individual trees scattered across the tundra. Biota of the forest-tundra ecotone is very similar to that of southern tundra (see above) and the difference between the two zones is in the absence of trees from zonal communities in southern tundra. 2. Open or sparse forests develop further south. Trees grow about a dozen meters from each other and often form regular patterns (Plate 9.1). 3. Close forests are composed of continuous stands of trees. The boreal forests of Northern Eurasia are known as taiga. Originally this term was used to describe the dark coniferous forests formed by spruce, fir, and Siberian pine (termed the 'dark taiga' species). However, in a broader sense the vast forests of Central and Eastern Siberia and the Pacific sector formed by larch and pine are also referred to as taiga or 'light taiga'. In the south, taiga is succeeded by the mixed coniferous and broad-leaved deciduous forests in the European territory and the Far East. In Western and Central Siberia, where the development of broad-leaved forests is limited by increasing aridity, a narrow zone of birch and aspen forests separates coniferous forests from the wooded steppe, while in Eastern Siberia coniferous forests border directly on the forest-steppes.